As the title implies, these images are open narratives, a glimpse or slice of the world caught in mid-stride or, if you prefer, like a fly in amber. 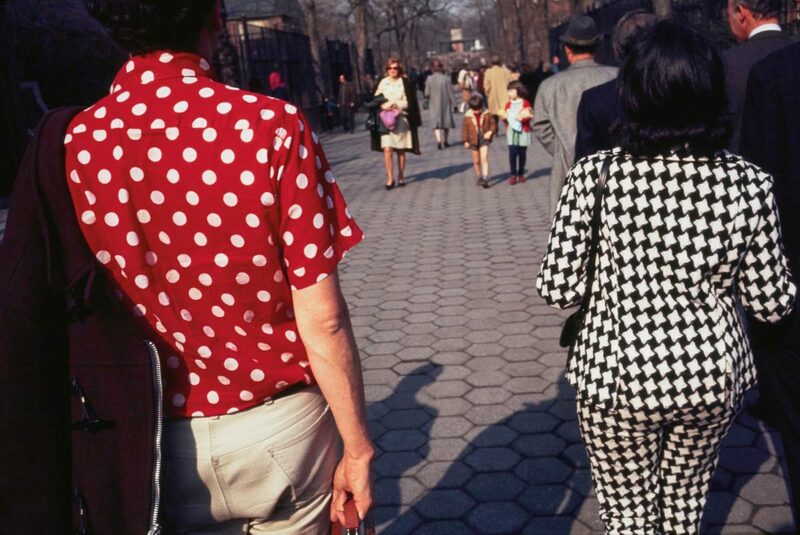 Winogrand was well known for being out in public and–click, click, click–peeling off hundreds and thousands of shots. Millimeters, and also moments. 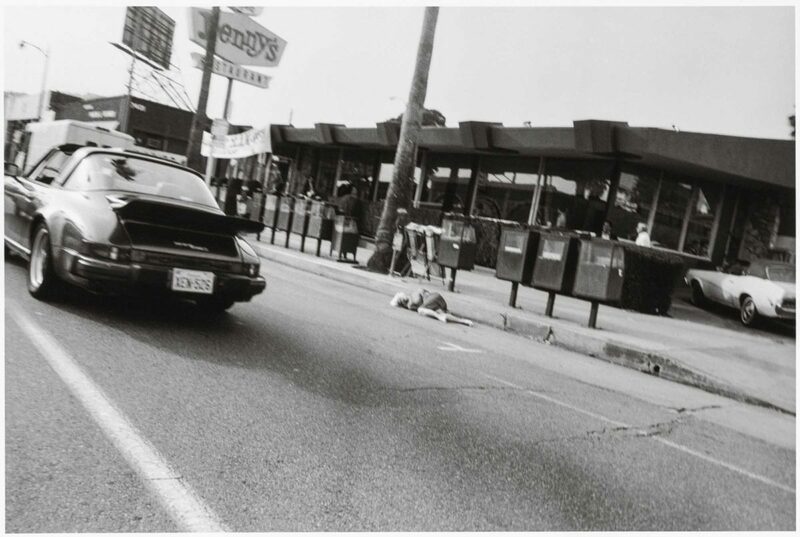 There’s a photograph in the book of a young woman walking along the sidewalk who (momentarily, of course) has her eyes closed. This might suggest that she’s shy, modest, demure, etc., but we know it could also be that she’s been caught mid-blink. Dyer makes an issue out of her closed eyes, which is why I bring this up. A split second later we’d have a different picture, wouldn’t we? What we have to keep in mind throughout is that this is Dyer’s baby. Not yours, not mine. At times he’ll give an interpretation of a photograph and we’ll beg to differ. But maybe our scenarios would have other people raising their eyebrows as well. Now, the problem with dissecting a photograph as opposed to a painting is that the photo was fixed in time in only a split second, a moment so ephemeral it was gone literally in the blink of an eye, and this is especially true of pictures snapped on a busy sidewalk or other places where crowds of people have gathered or are swiftly moving past. It’s an instant set in stone. A painter, of course, can labor for a certain effect, and thus we have something more substantial to mull over. We can legitimately ask, Why this tint, this angle, this expression? I don’t want to say that we can’t ask these questions of a street photographer, but unlike the painter he or she might very well reply, I was lucky. It may seem that I am contradicting my baseball analogy above, but not really. The aim is to connect, to wind up with something substantial or productive. But at that moment of contact the batter doesn’t know if he’ll hit a single, a double, or a foul ball. Not until the photographer is poring over the contact sheet (in this case) or downloading images into the computer (in our day and age) will the result become clear. 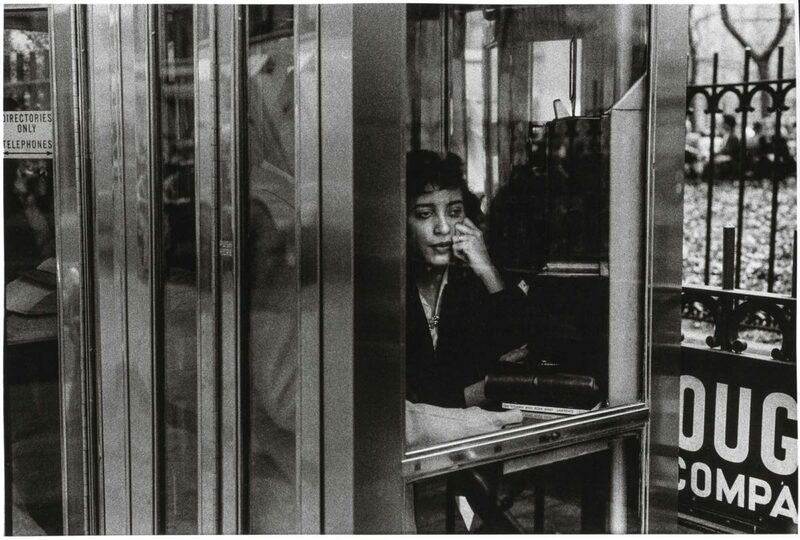 Unlike carefully contrived photographs, those by Annie Leibovitz or the late Herb Ritts, for example, Winogrand’s pictures have an impromptu or spontaneous feel. Some people might not attach much weight to their off-the-cuff feel, but there’s no denying that the best of these images retain the dynamics of the moment. 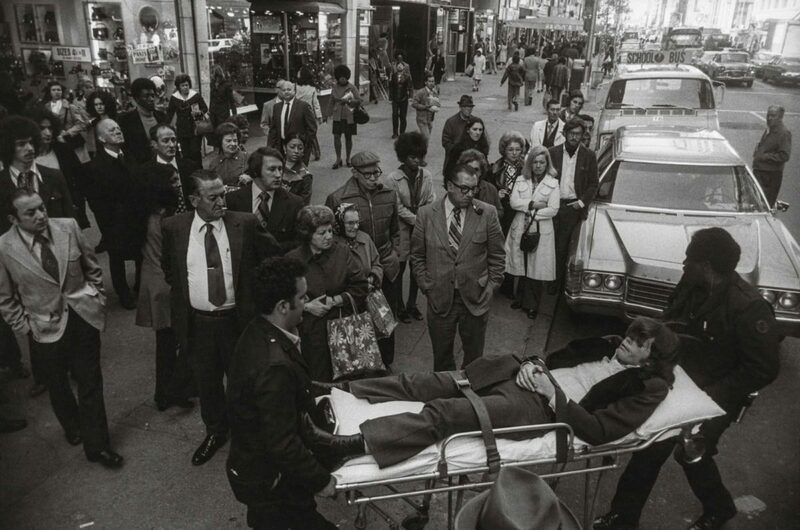 There’s one image of a young man strapped to a gurney and being wheeled across a busy sidewalk (presumably to an ambulance) while a small crowd gathers to watch. 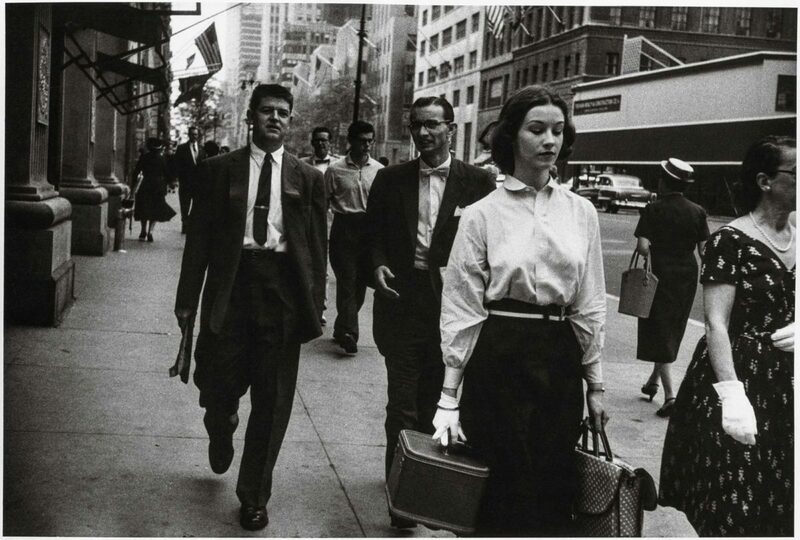 Winogrand was somehow able to position himself so that we become one of the bystanders with the same question in our minds: What happened? Some imagery we can skip past, but not imagery like this. We linger; we’re pulled in. These days, people are glued to their mobile devices, so it’s interesting to see what people used to do with their hands when they didn’t have cell phones in them. 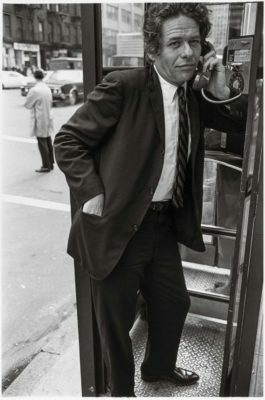 And, of course, the pictures of people in phone booths, of which Winogrand appears to have taken many, are also intriguing now as historical documents. I think that Dyer’s commentary is intended, in part, to make us pick up the slack and join in the conversation. That’s one good thing, although there’s the danger, danger or temptation, that he succumbs to, of extrapolating a fiction based on what he chooses to read into certain photos, that comes at the expense of someone in the frame. For example, there’s a tired-looking middle-aged man sitting on the edge of a trash container. When speculating begins to seem more like assuming then we’re in trouble. I find this also in his commentary of a photo of a young man who’s photographing a pretty young woman who’s kneeling at the edge of a park bench. Dyer assumes that the guy in dungarees next to her is her boyfriend. Well, maybe. But it might also be the guy who’s actually taking her picture. No matter; the reader is perfectly free, perhaps encouraged, to voice a dissenting opinion. While the book invites us to participate, there’s a bit of hit-and-miss here, too. Occasionally, one senses that Dyer isn’t really sure what to say about a particular image (after all, there are 100 of them to contend with), in which case he seems a bit flippant, like someone clutching at straws and then sugar coating them a little. But that’s not such a big drawback, really. Not even your star slugger is going to get on base every time he swings the bat. “The Street Photography of Garry Winogrand” is nicely designed, inviting throughout, and superbly printed in Germany by Dr.Cantz’sche, Druckerei Medien GmbH.